Found 7 file extension associations related to Belltech Greeting Card Designer and 1 file format developed specifically for use with Belltech Greeting Card Designer. 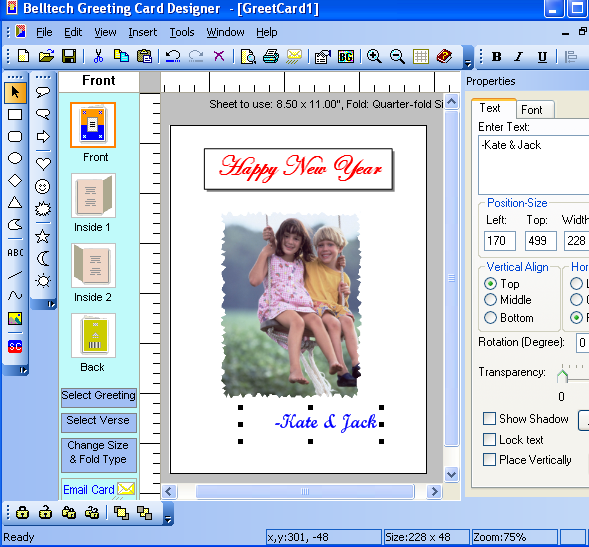 Belltech Greeting Cards Designer helps you create cool looking paper greeting cards in a matter of minutes and print them right-away on your printer. It is a professional quality greeting card designing and printing software. You can add your own photos, clip-arts, drawings and more. It also supplies 100's of simple verses that you can use in your card. Create Greeting Cards: Create great looking greeting cards with your own photos, clip-arts, graphics and background images. Use templates and graphics: Use templates and graphics. Verse Tool: Insert from 100's of simple to understand verses supplied with the application. Choose Type: Create half-fold or quarter-fold cards. Quick and Easy Design: Select and draw shapes and text. Resize, tilt, change color, fill with gradient color or do anything with your design elements. Convenient Design tools: Can draw rectangle/triangle/circle or any freehand lines and shapes. Choose Background: Use the supplied backgrounds or use your own. Supports any image of type bmp, jpg, gif, tif, png and wmf. Use your own clip-arts, logo and photos: We supply you with many graphics that you can use, but you can use your own pictures, logos, clip-arts and design the perfect card you want. Supports any standard papers: Supports all standard greeting card papers from Avery and other suppliers. Cut-Copy-Paste: Offers cut-copy-paste functionality for all the design elements. You can also copy-paste texts and images from other applications. If you need more information please contact the developers of Belltech Greeting Card Designer (Belltech Systems, LLC), or check out their product website.